I’ve been fine-tuning some Terraform config for Azure Application Gateway lately, and have thus been fine-tuning my understanding of its components. This Microsoft Doc about the App Gateway configuration was quite helpful because of it’s diagram. General: A listener can only be associated with 1 front end IP (either private or public). Originally I thought that I could have both a private and public front-end that were associated with the same listener, and thus the same rule with a backend. This isn’t possible, and instead you must have unique listeners to each front end configuration. This was seen while trying to add an additional rule after an original was created. I haven’t yet tried to perform a ‘terraform apply’ from a fresh start with two rules referencing the same backend. For example, if I have port 80 on my private front-end config, I can add multi-site listeners based on hostname here to target multiple rules and backends. But this means I cannot use port 80 on the public front-end configuration anymore; a different port would be required. 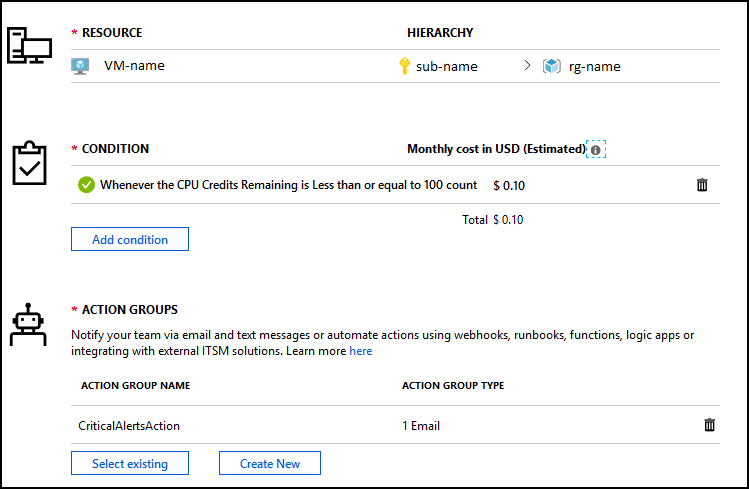 I discovered something interesting while working with Azure Monitor alert rules recently. If you have an alert that is firing based on a condition, it will continue to fire until the condition is cleared, even if the alert rule itself is modified, disabled, or even deleted. 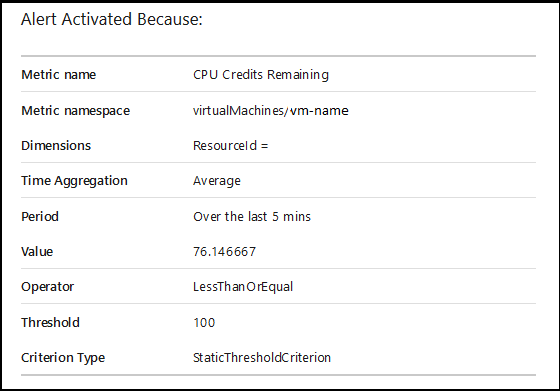 I have a B-Series VM, and want to alert on the “CPU Credits Remaining” metric, to pro-actively catch intervals when CPU usage is causing credit exhaustion and thus reduced compute capacity. I created an Alert Rule to fire when the “CPU Credits Remaining” to fire when the value is 100 or less. It was configured with a frequency of 1 minute and a period of 5 minutes (because I wasn’t thinking of the implications at the time). This worked just great for a while! And then a rogue Windows Update process got stuck consuming 60% of the CPU for a period of time, and the credit count dropped all the way to zero. The alert began to fire as expected, once per minute, which quickly became excessive and drowned a bunch of mailboxes in alert-overload. Even deleting the rule did not stop the alerts from triggering. Interestingly, if I modified the action group to use a different target email address, that was immediately effective. This allowed me to black-hole the emails until I had resolved the CPU utilization problem and waiting until the credits built back up.